Erbil – Iraqi Forces liberated new areas of the Old City in Mosul and are close to regaining control over Tigris bank, ISIS’ final stronghold. ISIS is now cornered within few streets west of the city, while Peshmerga forces thwarted a wide-ranged attack on al-Zarka area, southeast Kirkuk. 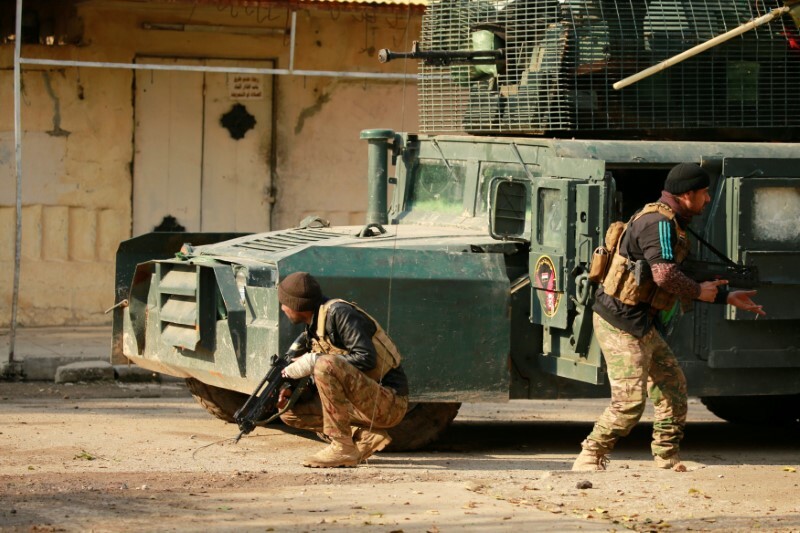 Clashes continued between Iraqi Forces and ISIS within a very small area estimated to be 500 meters long and 200 meters wide, according to security commanders. Head of Federal Police Raed Shaker Jawdat confirmed that the troops had liberated the whole Saray Door area and several other areas towards Khalid Ibn Walid street and al-Nujaifi area as part of the southern axis of the Old City. Federal Police is advancing towards al-Medan, al-Kawazeen and then Qouleiat, whereas Counter-Terrorism Service head towards Bab al-Shatt and al-Shahwan on the other bank to liberate alleys from ISIS militants. As clashes continue, security forces are working on securing corridors for besieged civilians, some of which are still strapped under destroyed buildings. Officer of Counter-Terrorism Services Jassim al-Najafi told Asharq Al-Awsat newspaper that hundreds of civilians, mainly children and women, escape the Old City daily. He added that the citizens leaving the area suffer from malnutrition and severe medical conditions and had been transferred to camps where they received medical care. On Monday morning in Mosul’s Old City neighborhood, a female suicide bomber hiding among a group of fleeing civilians claimed she was injured, and when civilians gathered to help her, she detonated herself killing two and wounding nine others. Concurring with Mosul battles, another ISIS attack took place southeast of Kirkuk. Head of the fifth platoon in Defense and Emergency forces of Kurdistan Lieutenant Said Ali Mohammed told Asharq al-Awsat that they had already been informed that ISIS militants will intensify their battles in Tuz Khurmatu and al-Zarka axis. He added that Peshmerga advanced about 30-40 kilometers during the clashes with the terrorist organization. Mohammed added that according to intelligence information, the troops managed to kill over 10 militants and injure over 15 while others fled the area leaving behind their weapons and supplies.